If you’ve been practicing yoga for some time now, you may go through moments when you don’t feel like doing it anymore. Maybe you had a string of bad teachers that were uninspiring. Or perhaps you haven’t been feeling strong in your body. Or maybe you’re just over it. You don’t feel like doing yoga anymore because it’s not giving you what you had initially signed up for. When this happens, it’s good to reconnect to why you signed up for yoga in the first place. Was it because you wanted a calmer mind? Toned arms? Or were you attracted to the whole philosophy? If you’re finding that yoga isn’t providing what you had initially signed up for, try switching studios and find teachers that come highly recommended. 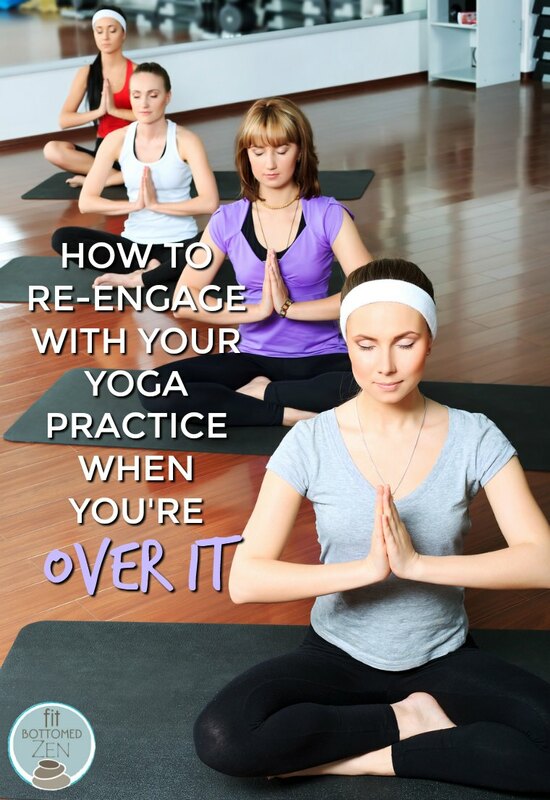 But if that’s not an option because there are limited nearby spots to practice in, here are a few other ways you can re-engage with your practice before calling it quits. If you’re spending an entire class thinking about how awful it is, you’re not really in the class, you’re stuck in your head! And you can’t benefit from yoga when you’re hosting this mental negativity. To help alleviate all the complaining, allow the yoga to do its thing by getting out of your head and dropping into your body. Use your breath to get you there. Put more emphasis on your physical actions, and less attention on your thoughts. This will help you reignite the yoga that’s going on within and around you. Remember, yoga means union. Don’t allow your mind to take over the class! If you’re disappointed by the physicality of a yoga class because it’s too soft or slow, it doesn’t have to be this way! Most yoga poses rely on an engaged core, which means you can be building muscle while standing in Tree. Pull your abdomen into the spine for your entire class, and you will feel the results of your effort. Just because the instructor isn’t talking about six-pack abs doesn’t mean you can’t be working on yours. Did you know that it requires more stamina to move slowly than it does to go fast? Your muscles must work harder and more efficiently when going at a slower pace. So if you want to engage yourself more into your practice, slow down! The concentrated effort will be more precise and provide greater results. Often the reason people want to call it quits on yoga is because they are bored. They’ve been doing it for awhile and they don’t find it exciting anymore. The remedy for this is an attitude adjustment. Switch back into your beginner’s mind! Try to remember when it was all new — when the sanskrit sounded intriguing and the physical challenges were like nothing you’ve experienced before. What other fitness routine has you holding headstand for 15 breaths? By going back into a beginner’s mind, you stimulate your curiosity to feel your way through the practice and discover what’s waiting for you on the other side. So if you’re uninspired by your yoga practice, you can work on getting out of your head, engaging your core, slowing down and re-entering your beginner’s mind to tap into the reason you signed up in the first place. Great Share!! I like the valuable information shared. We’ve all heard the advice, if we want to lose weight, we need to eat less and move more. It seems simple enough, but it’s a largely useless proposition without a plan.